Here you can see a prime example of dereliction and decay. A long since abandoned office block and waste land, combine to form a hideous eyesore. The area has been in a state of decay for at least the last three years; and not surprisingly, is being used by "fly tippers" to dump their waste. In an attempt to "improve" the eyesore, the authorities have erected a particularly ugly set of iron railings and wooden boarding. This should be a prime piece of real estate in Croydon; it is opposite the Home Office (you would have thought that they would have complained! ), close to the Whitgift Shopping Centre and near to schools, churches and residential dwellings. Yet it resembles the Bronx in New York. As our ever popular Council (who won my prestigious “Worse Than Worthless” award last year) says, they are trying to get Croydon recognised as a place to make films; clearly this part of Croydon would be well suited to filming the urban decay and dereliction of the Bronx. If you feel that something should be done about this area then write to the Council, the media and your local MP (remember to refer to this site). 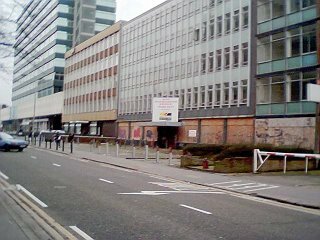 I have put together an automated slide show of pictures of this squalid part of Croydon. If you wish to watch it please click this link Home Office.